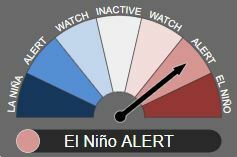 THE Bureau of Meteorology has revised its ENSO Outlook to “El Niño Alert” meaning the chances of an El Nino forming during Spring is now 70 per cent, or roughly three times the normal risk. Recent patterns in the tropical Pacific Ocean and in the overlying atmosphere indicate the early stages of an El Niño event could be underway. An El Niño in Spring typically means below average rainfall across eastern and northern Australia and above-average temperatures in the south east. In Summer those same weather patterns usually contract to northern Queensland. Bureau of Meteorology manager of long-range forecasting Dr Andrew Watkins said if these conditions were to occur, the chances of drought-affected areas in eastern Australia making a recovery over the coming months would unfortunately be lowered. “Like everyone in the Australian community, the Bureau of Meteorology is hoping regions being affected by drought will recover soon. However, if an El Niño were to occur, we’re more likely to see drier and warmer than average conditions,” Dr Watkins said. During an El Niño event, warmer waters gather in the eastern Pacific Ocean with cooler waters closer to Australia. This typically means less rainfall over the Australian continent. An El Niño event typically ends around Autumn. The Bureau is also closely monitoring developments in the Indian Ocean where a positive Indian Ocean Dipole (IOD) event is being predicted by a number of international models.